Over the past three seasons, DRIVE Sports and Hermiston Basketball Club hosted nearly 1,100 Youth Basketball Teams, for a reason! Hermiston has the best basketball facilities around. HANDS DOWN. We use certified officials on our courts. Best tournament prizes and coaches gifts. Championship game introductions with lights & Music. We have not found a league schedule we couldn't work around. AJ's printing brings the highest quality, lowest priced tournament apparel. Online registration AND Tournament Series Discounts! New This Year- Look for our ALL STAR GAMES to be played on Saturday nights after regular games! HYBA - Hermiston Youth Basketball Association. This is the recreational program that has been around Hermiston for decades! It is open to all Hermiston boys and girls grades 3rd-6th. 3rd & 4th graders are randomly placed on teams. 5th & 6th grades players attend a tryout and are placed on teams with a "draft" type system. ALL CHILDREN THAT WANT TO PLAY HYBA ARE ALLOWED - NO ONE IS CUT FROM A TEAM. Each season, HYBA will have signups in mid-late November and early December. Coaches will have a meeting in late December or early January. Practices will be twice per week beginning in mid-January. Games will be held every Saturday (all in Hermiston) beginning in late January. Keep watching facebook and our website for registration dates. We will supply HYBA teams with everything they need for the season: gym time, uniforms, equipment, game schedules, referees; the entire package is provided for you. We are always seeking coaches and volunteers to help with this program; please contact us if you are interested. AAU - Our club currently has about 20 AAU teams. AAU teams are often times more competitive than HYBA teams; an AAU team typically requires greater time commitment from the players and parents. 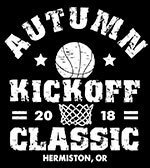 Hermiston hosts four AAU basketball tournaments per year that our teams, along with out of town teams, participate in. Hermiston AAU teams usually also travel to many tournaments out of town. Each Hermiston AAU team will make their own decisions on how many tournaments to attend and how far to travel. Those decisions are up to the coach and parents of each team. Teams may join the club as a complete team OR they may come to us with a coach and one or two players. In that situation, we will help organize a tryout to help the coach find more players for the team. Our club will supply each AAU team with: 3 gym practice times per week; balls, ball bag, first aid kit, uniforms, AAU cards and $150.00 in tournament allowance per season. Teams may also choose to purchase their own uniforms. The club also offers many opportunities for AAU teams to earn money for tournament entry fees by working at the tournaments we host. AAU teams really make their team decisions as a team, the club offers support in any way we can; but because of the level of commitment required from families, we feel it is up to each team to set their own schedules and team guidelines. Often times players will come to us looking for a team if there is an established team looking for a player in that players age group we are happy to connect the two. In the case where there are no open teams, we will put the player on a list and contact them if a coach becomes available. We do our best to place as many players as we can; but not every player will be placed on an AAU team. We need more coaches to volunteer, if you are interested in coaching a competitive, traveling AAU team, please contact us.